While browsing at a bookstore I came across a recipe by Y3K magazine featuring Coco Kong's cookbook on various "pau", including this steamed version of a pau filled with chicken curry. 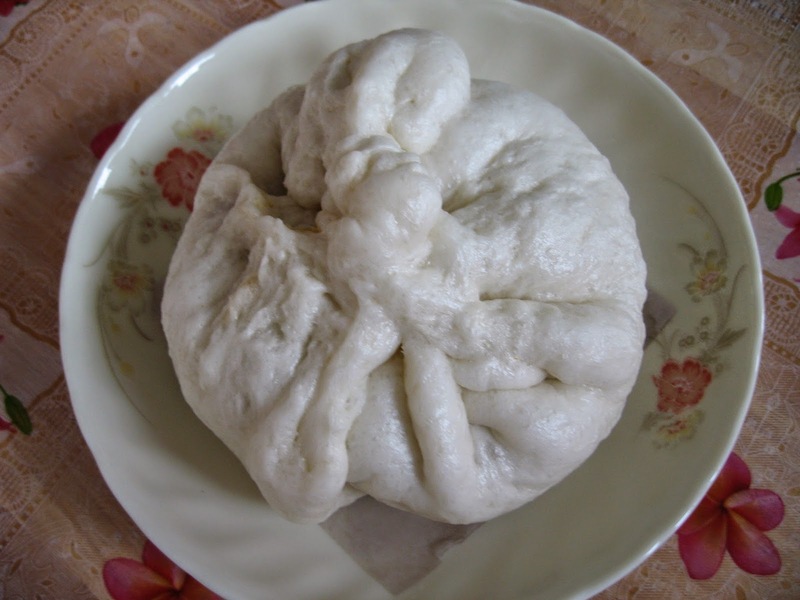 As I was reading, I remembered my friends telling me about a coffee shop located in Klang which sells this speciality pau. 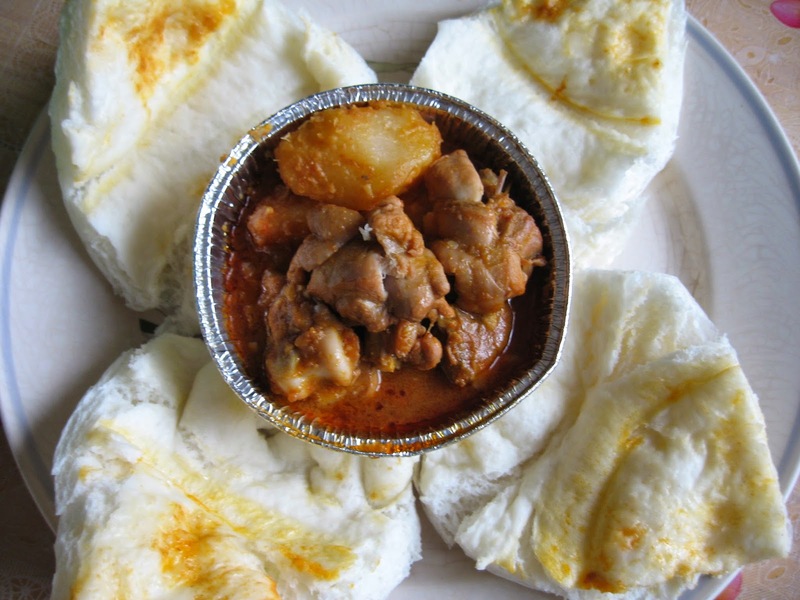 I have yet to visit that shop to sample their speciality, but after reading the recipe from Coco Kong, I guessed I am gamed to try it out. Now, here I am sharing my humble experience. Half-way through making it, I realized that these pau are going to be huge because I needed plenty of dough to wrap up the foil cups! The end results was totally out of my expectation. I did not envisage the pau to be this big. 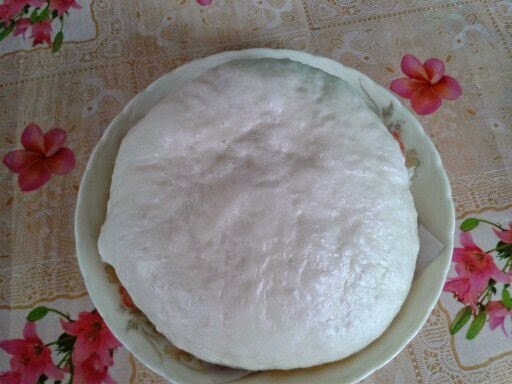 Anyhow, I managed to make four gigantic pau, measuring more than six inches in diameter each. 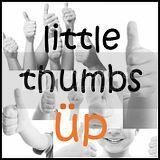 It was very satisfying when my son showed me the thumbs up! We both agreed that they were truly finger-licking good! 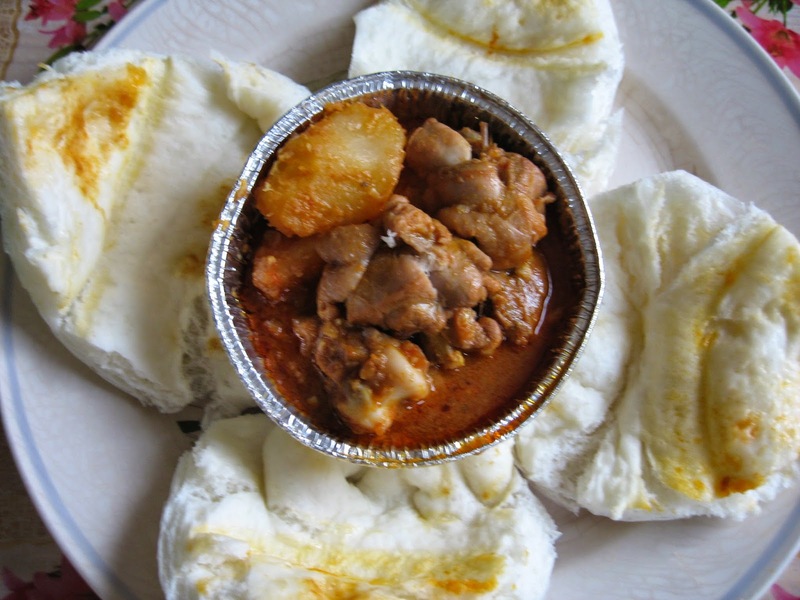 A point to take note - the pau dough was enough to make four huge pau but there were plenty of chicken curry left over. So, if you are making this, do remember to reduce the amount of chicken curry or alternatively, make more pau dough to use up the chicken curry. 1. Heat wok until hot. Add in 4 tbsp cooking oil. 2. Saute chopped garlic and shallots until fragrant. Reduce to medium flame. 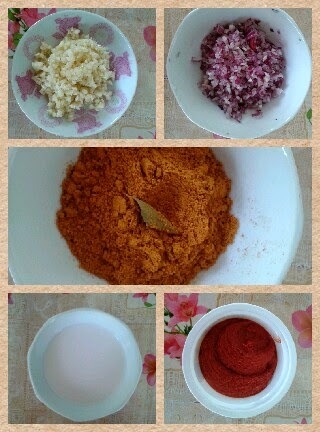 Add in minced chilli. Stir to mix well. 3. Add 2 tbsp coconut milk , followed by the curry powder. Stir evenly until red chilli oil oozes out. 4. Add in chicken pieces and mix well. 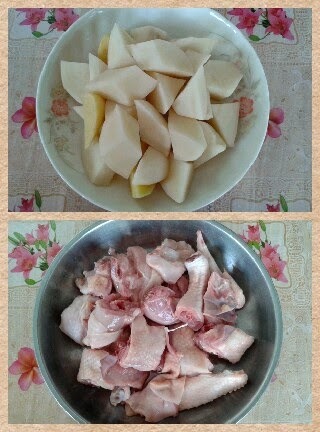 Fry for 2 to 3 minutes. 5. Add in 4 Chinese rice bowls of water. Bring to a boil. 6. Pour in the deep-fried potatoes. Stir to mix well. 7. Allow to simmer for about 12 to 15 minutes until done. 8. 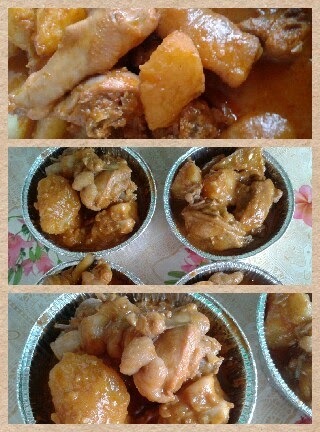 Remove and let it cool down before spooning the curry chicken into 4 aluminium foil cups. 1. Place pau flour, baking powder, sugar and shortening into a mixer bowl. Dissolve yeast in warm water. Pour yeast into the mixture and knead until a smooth dough is form. 2. Cover dough with cling film and let it rest for about 30 to 40 minutes or until it has doubled its size. 3. After proofing, divide dough into 4 portions. 5. Alternatively, wrap a piece of rolled-out dough on top of the aluminium cup and gather the edges to seal at the bottom of the cup. Bottom left : the edges are sealed underneath the pau. Bottom right : the edges are sealed on top of the pau. 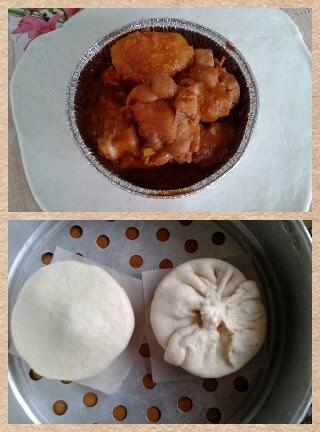 Chicken curry inside a steamed pau! Hi Doris, what an amazing way to serve curry chicken! The freshly steamed bao, dipped inside the curry sauce... divine! Actually there is a baked version which I will try later. Thanks so much for these great ideas! I will be giving this a try this weekend. May you be successful in your endeavour. These 3 researches from big medicinal magazines are sure to turn the traditional nutrition world upside down!